The noises emanating from my basement are quite frightening, even after I remind myself that the rap rap rap is simply the furnace kicking into high gear and the glug glug glug merely water rushing into the dishwasher. I live in a turn-of-the-20th Century home in Cleveland and I would have never imagined this spooky basement to be its most salvageable asset. 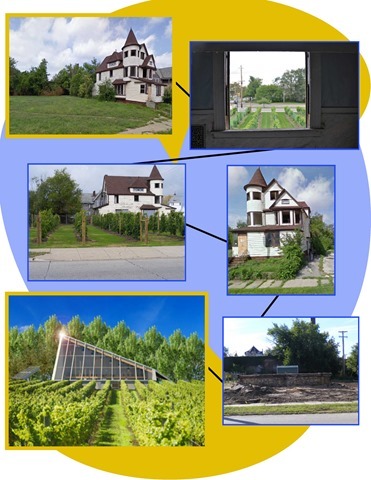 It’s a great thing that others share a differing perspective, especially the folks at Neighborhood Solutions who created Cleveland’s BioCellar, “a new type of urban farming project”. The shear quantity of houses, apartment buildings, and commercial spaces located in Cleveland is too great for our downsized population. While creative adaptive reuse projects are enlivening Downtown and Midtown, much of the “inner city” is plagued by loss of investment, population, and a reason to maintain the great homes of last century. Sadly, many of these once-loved homes are bulldozed, returning the land to a semi-improved but still undesirable plot. Neighbors may pick up the property for pennies on the dollar to create urban gardens, but most back-filled basement shells sit in a City or County LandBank awaiting what, I can’t tell. Fortunately, a local non-profit sees the great potential in torn-down houses. Not surprising to anyone who has a cellar like mine, the temperature down in the basement is always sweater weather, ie 50 degrees. This is apparently an ideal growing condition, when roofed over by the glass roofs we all associate with traditional greenhouses. Read the article by FastCoExist or Google “BioCellars” to discover more. Blighted homes are getting a new life, community dwellers are finding jobs, and soon shiitake mushrooms will be a Cleveland export! What more could you ask for?